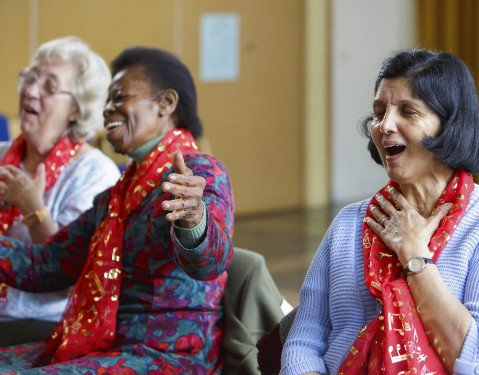 We run a variety of weekly well-being and mindfulness focused groups offering befriending opportunities for older, unsupported adults in the borough, regardless of faith or culture. Our groups meet weekly at local venues offering companionship and an opportunity to share an interest. generation at Goldsmiths, including an IT group and the annual summer ball. Run in partnership with Trinity Laban Conservatoire of Music & Dance who provide us with a qualified singing tutor during term time. Enjoy singing and relaxation activity. Part of Trinity Laban’s ‘Inspired not Tired’ programme. Arts and crafts workshop led by our qualified arts practitioner. Enjoy a good chat while exercising your creative talent! Materials Provided. A social group for local men who enjoy playing dominoes and other table top games while enjoying a good chat. This is a group for those keen to keep fit and enjoy company with friends. Tea/coffee and a chat first, then fun exercises accomodating to all led by our qualified practitioner. Ageing Well in Lewisham-LCC is a small registered charity, founded in 1999, that provides support and befriending services to people aged 55+ living in south Lewisham in south east London. A small staff team provides individual support to help people access services that will improve their quality of life and help them to maintain their independence living in their own home. We assist clients to access transport to enable older people to attend tutor led groups in their local community where they can share an activity, learn a new skill or join an exercise group and make new friends, helping to reduce social isolation and improve their physical and mental health and quality of life. We identify referral pathways for individuals who require additional support.